The facility consists of a 5x7m platform, built at 3.5 m depth of water and connected to the beach via an about 140 m long and 1 m wide bridge. The platform is equipped with a technical container, in which there is measuring equipment for registration of wind speed, wind directions, air temperatures and wave height. In the container there is also a working table with a vice, and the most normal tools. The Platform is equipped with: a hand served 2½ m high crane, which has a lifting capacity of 600 kilos. A mobile working grating can be lowered below the water surface. From here the inventors can experiment with their models. Possibility of fasten static constructions. A rubber boat as “working platform” around the platform (can be handed over after agreement). Sea boots for loan, and a lifebuoy and swimming west’s. Technical container with electronic measuring equipment is available for registration of wind speed, wind direction, air temperature and wave heights. Electricity installation. Located at 3.5 meters water depth in the Nissum Bredning – a fjord in the northern Denmark connected to the North Sea. The test station is designed for use for wave power inventors, where models can be tested for a short time as well for a long period. Inventor who wishes to use the test station has to arrange a time with Folkecenter. The further conditions regarding rent of the test station is arranged among the people involved. See rules for rent and supervision here. You can use the test station for a single day or for a longer period of time, depending on the needs of other inventors for using the test station. After a decision made in 1998, in cooperation with the Department for Energy and Environment, the Wave power association and Nordic Folkecenter for Renewable Energy, there is now in Nissum Bredning, Northwest Jutland, erected facilities for testing of wave power models. 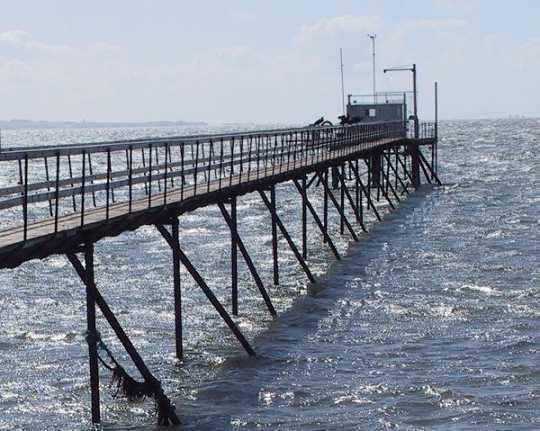 Folkecenter Wave Test Station is located in Denmark.